Summer Cruising Area W. Med -Riviera/Cors/Sard. 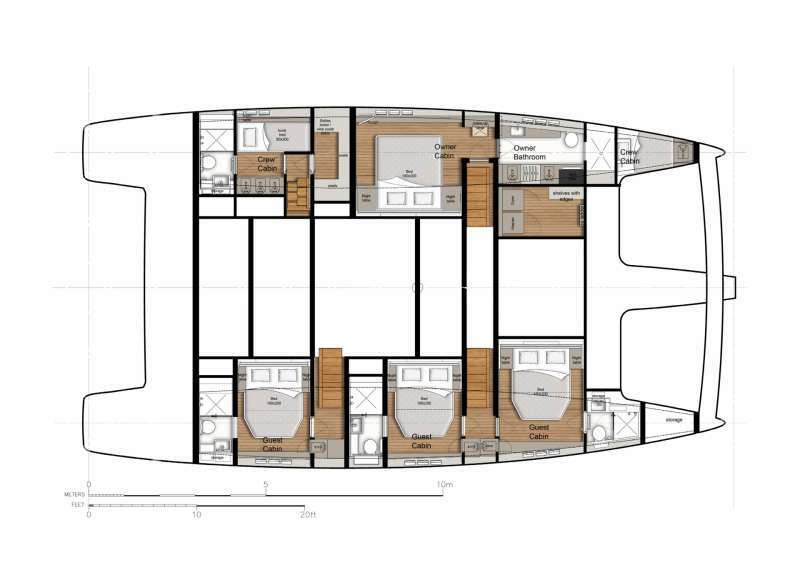 A 2019 launch, the brand new luxury sailing catamaran Sunreef 60 OCA has just joined the Sunreef Yachts Charter fleet. This stunning yacht not only features a smart and charter-friendly layout but boasts some impressive social areas at the bow, stern cockpit and flybridge.OCA’s light-filled interiors were given a relaxing and harmonious décor mixing greige and cream. Up to 8 guests can enjoy sophisticated accommodation in the yacht’s three classy ensuite cabins and the stylish master suite. The bright main saloon, generous stern cockpit and ample front terrace merge into one luminous semi-open lounge area with a functional galley, cosy settees, a widescreen LED TV and a big dining table for 8 guests. While the well-equipped galley provides for fine cuisine, the indoor herb garden ensures a steady supply of freshness to OCA’s rich menu.Up on the catamaran’s impressive flybridge, guests will bask in the Jacuzzi, or gather for drinks and dinner while enjoying the spectacular sea view.A lucky find for water sports enthusiasts, OCA boasts a great selection of water toys, including towable tubes, diving scooters, drone submarine for underwater exploration, wakeboard, water skis, e-foil for flying over the water, kiteboarding gear and stand up paddle boards convertible to kayaks.This dream yacht is operated by a dedicated crew of 3 ensuring top service and a memorable summer charter experience in the West Mediterranean or dream winter cruises in the Caribbean. Contact us for rates and current availability or to book a charter aboard OCA!